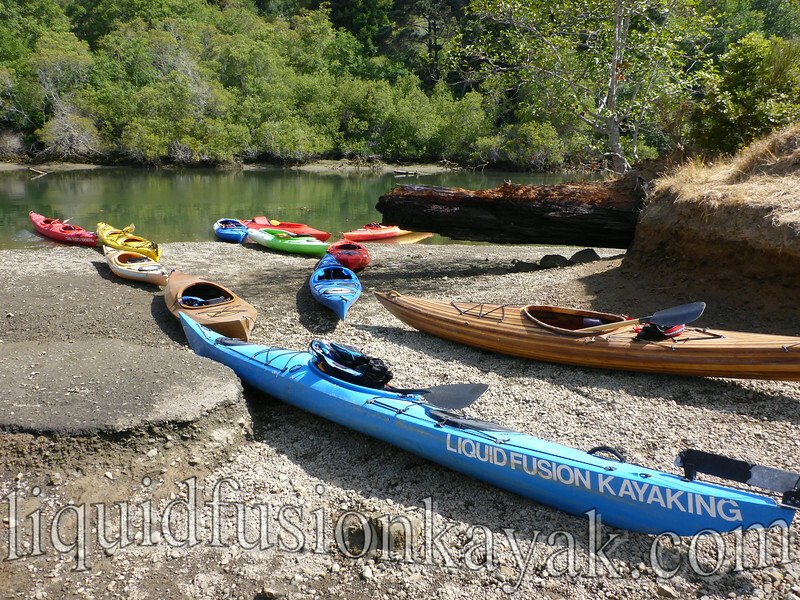 Twelve kayaks sit on the launch ramp at Dolphin Isle Marina on Fort Bragg's Noyo River. 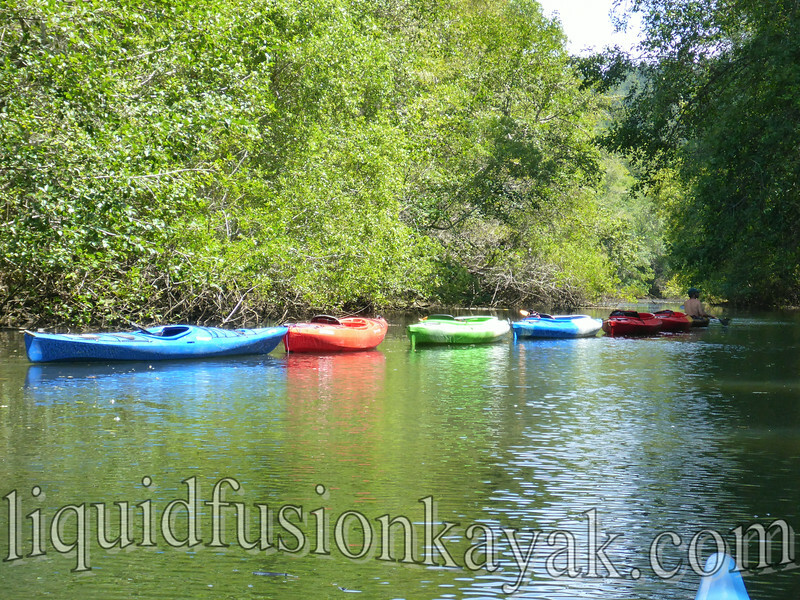 They are a colorful collection including sea kayaks, recreational kayaks, tandems, and singles. 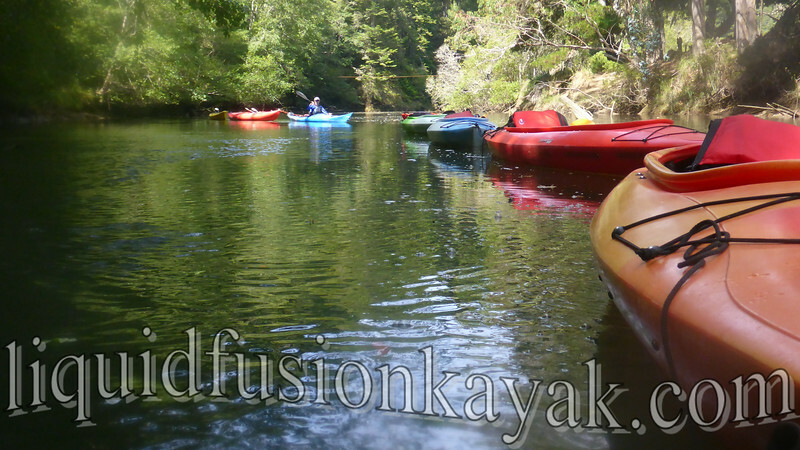 If it wouldn't be for the 2 handmade wooden kayaks, one might say they looked like a handful of skittles. Instead of lining them up side by side for a group launch, this eclectic collection is lined up bow to stern for the long haul. They need to make it 2.5 miles up the river to meet the Skunk Train. 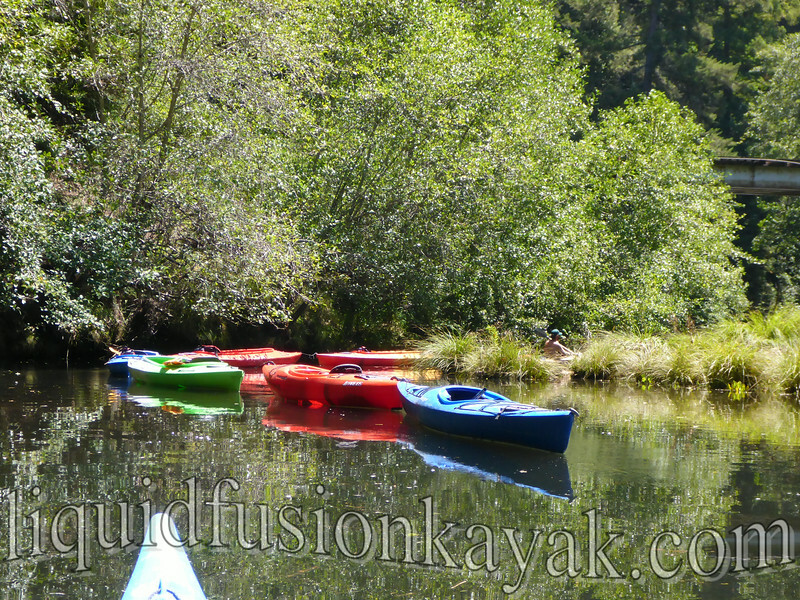 Today's trip is a double as Jeff will be meeting and guiding a Tracks to Kayaks trip and Cate will be teaching and leading a group of Boy Scouts who caught the train from Camp Noyo for a kayak lesson. 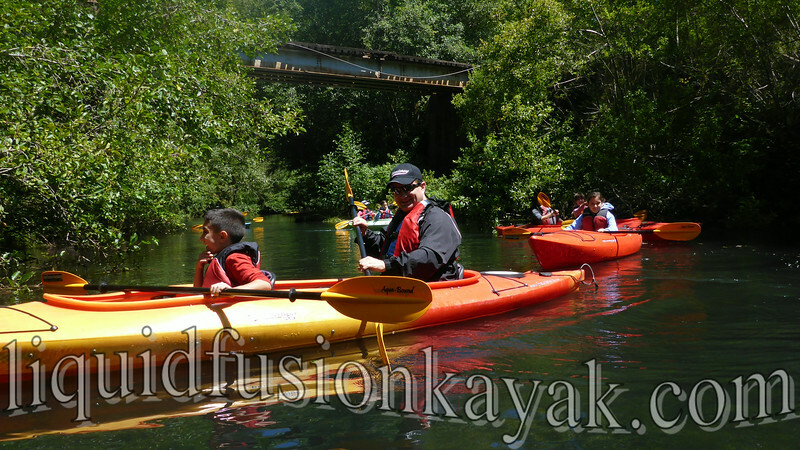 But for now, the challenge is how to get 12 kayaks - over 175 feet of kayaks up the Noyo River. In previous years, we would load the boats up and trailered them to the train depot. 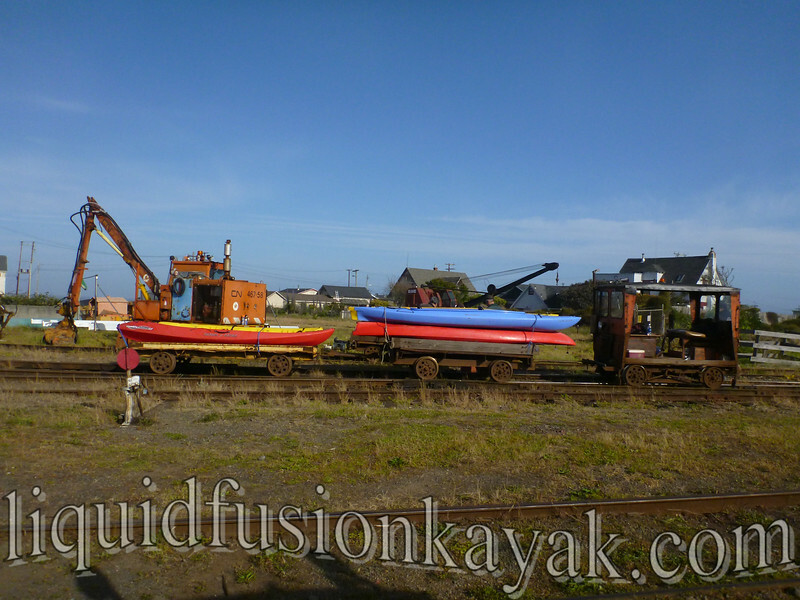 At the train depot, we would load them on the speeder car which would drop them off at our tracks to kayaks landing. Last year, the speeder car was out of commission so we had to improvise. We decided to start towing the kayaks up the river to meet the train. It is a soulful journey up the river. Towing up the river is slow and methodical giving one time to relish the beauty of the Noyo River and time to hone one's forward stroke and towing technique. Efficiency of forward stroke is not the only name of the game. We are the engine but unlike the train, there are no tracks for our kayaks to follow. One has to learn how to make a chain of kayaks mind through narrow corridors of willows and obstacle strewn stretches of the river. One has to plan for negotiating the line up around a bend in the river and has to plan for gusts of wind which will make the best laid plans go awry. But then there comes the concept of flexibility and problem solving. What do you do when the third boat in your line up is hung up? Do you jettison them all and risk them getting blown astray? Or do you tow them all back with you as you detangle and get the unruly one back in in. It reminds me of my days teaching special education. This week, as Jeff and I paddled up the river with our fleet of kayaks behind us. I did the math. Jeff was towing 6 kayaks with a combined length of 80 feet and I was towing 4 kayaks with a combined length of 63 feet. We will admit that it is a bit of a slog but one that gives us time to enjoy the peacefulness and beauty of the Noyo and to share its magic with others.